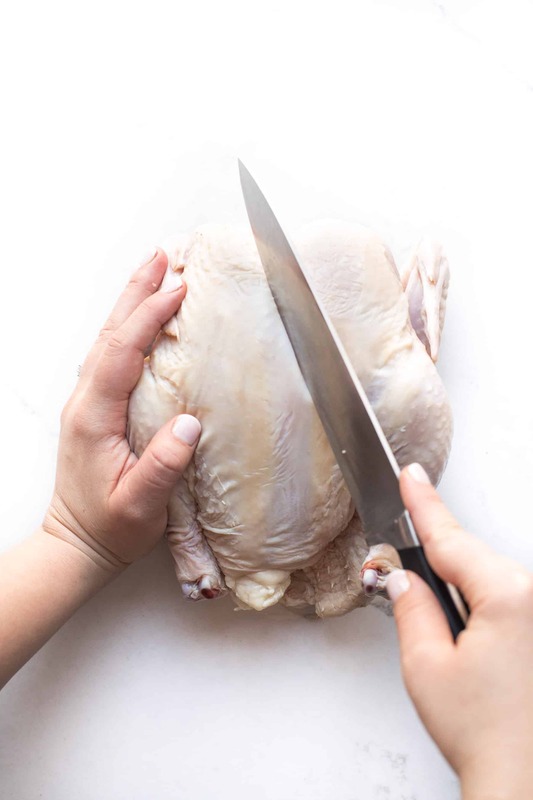 How To Break Down A Chicken – A comprehensive video tutorial showing you how to carve and slice up a whole chicken into 8 pieces, saving the carcass for bone broth. 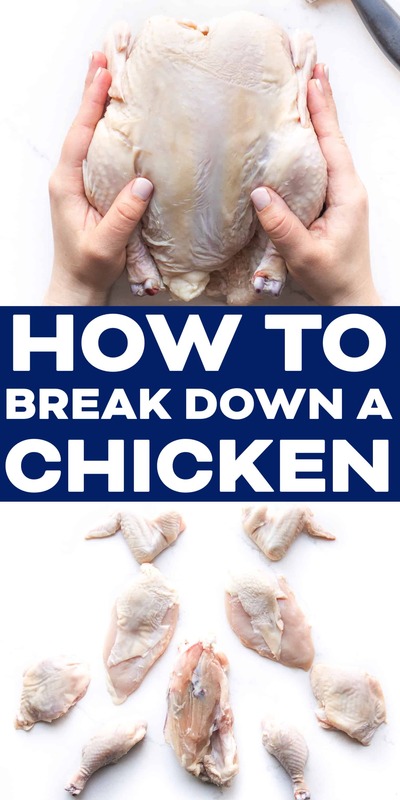 Breaking down your own chicken is much easier than you think. All you need is a good chefs knife that is nice and sharp using a knife sharpener. Let me show you how easy it is! At the end of this post is a comprehensive video where I narrate and show you exactly how to break down a whole chicken. 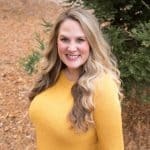 I’ve already shared my love of Butcherbox (which I highly recommend!) with all of you. It is where I source the highest quality free range, hormone and antibiotic free chicken. It is the only place I will buy chicken. One of the ways I save money and get the most value out of my Butcherbox order is by ordering the whole bird. I do the Big Custom Box, getting 8 whole chickens (along with other cuts of pork and beef). 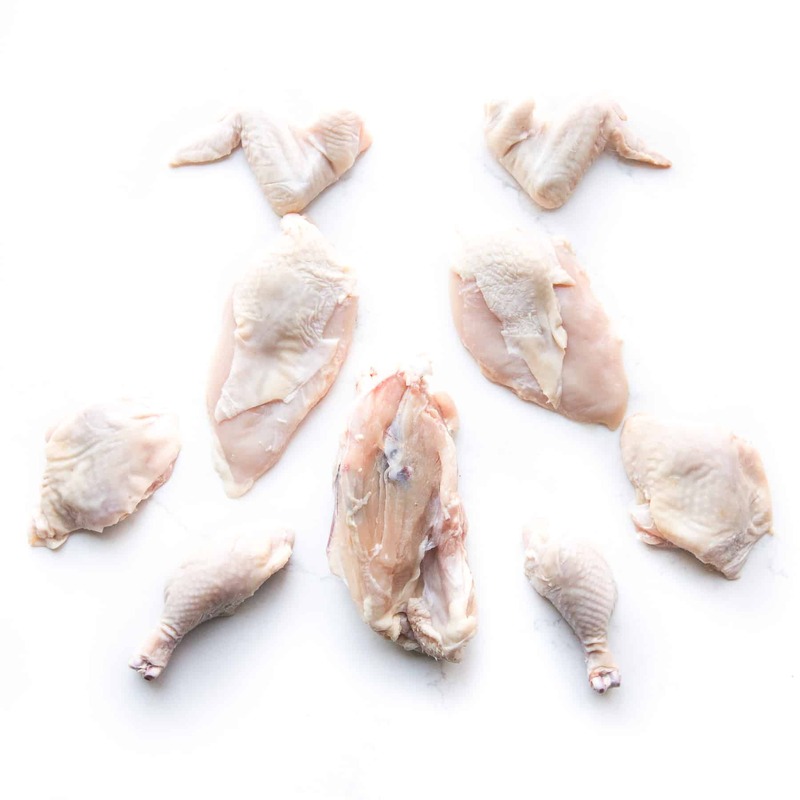 I break down each whole chicken myself, which results in 2 breasts, 2 thighs, 2 wings, 2 drumsticks, plus the carcass I use to make homemade bone broth. Such a great savings! We eat roughly 2 whole chickens worth of meat a week, so 8 chickens a month is perfect for my family of 2 adults, a 3 year old and a 7 month old. 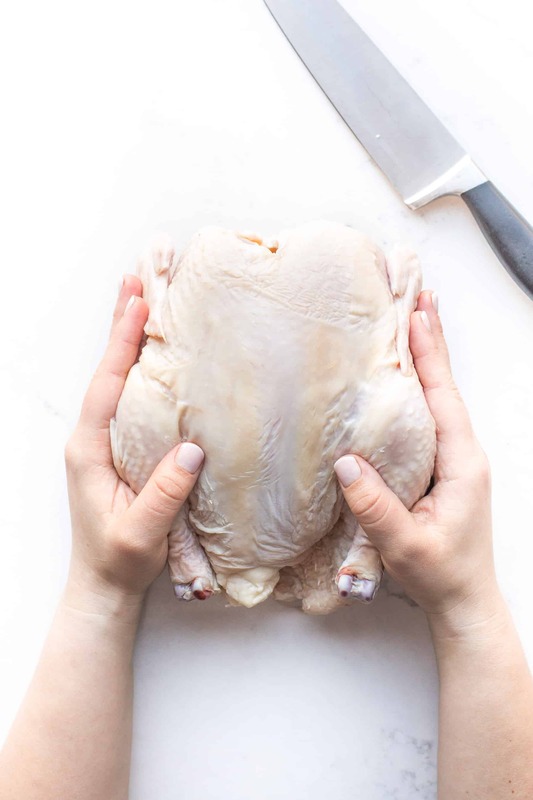 Being able to butcher your own whole chicken will allow you to get the exact cuts of chicken you like. One of my favorite chicken cuts is skin-on boneless chicken breasts. You almost never see this in stores because the chicken breasts are always skinless and boneless. But by butchering the whole chicken myself, I can get my very favorite cut! Same with skin on, bone-in chicken thighs. Feel free to adjust the carving technique I demonstrate in the tutorial video to suit your personal preference. You can easily take the skin off any cut, as well as remove any bones. Once I break down the whole chicken into 8 pieces, I store the cuts in my very favorite airtight containers. 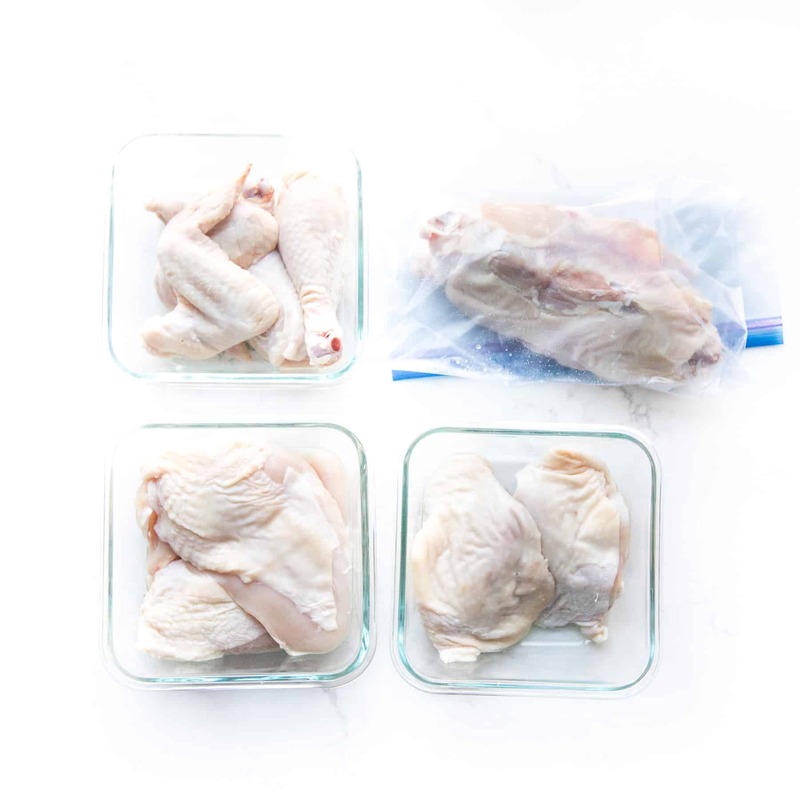 I do 1 container with the chicken breasts, 1 container with the chicken thighs, 1 container with the drumsticks + wings, and then store the carcass in a freezer safe ziptop bag. I keep the cuts of chicken in the fridge. They will keep for 1 week. I keep the carcass in the freezer. It will keep for 6 months. I try to avoid food waste as much as possible. Not only to save money, but because it feels better for the planet and the sacrifice of the animal. By breaking down the whole chicken, I’m able to use every cut of meat for meals, plus use the whole carcass to make homemade bone broth. Homemade bone broth is SO MUCH more flavorful and delicious than anything you will buy in the store. Amazing to use in soups, sauces, or even just to sip on since it is packed with protein, vitamins and minerals. I use the chicken carcass, as well as the thigh, drumstick and wing bones after we have cooked and eaten that cut of chicken. Store the carcass in the freezer, and add in the other bones to the freezer bag when they are ready. 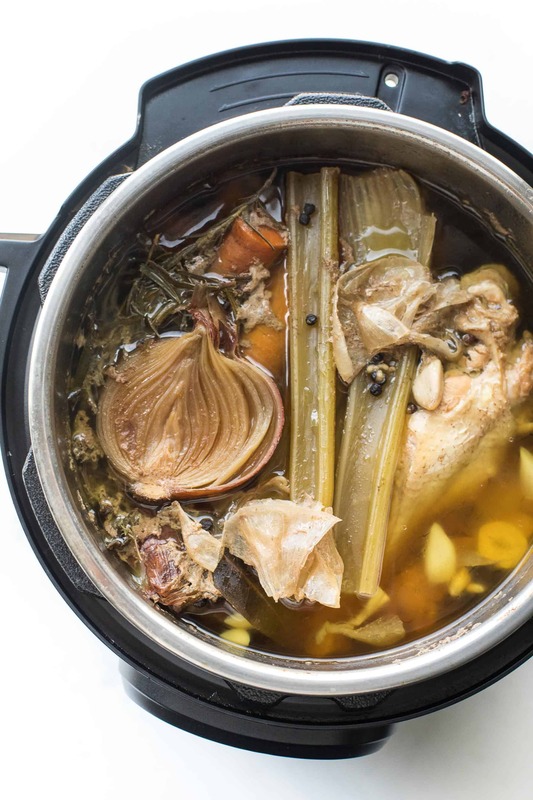 Make a batch of bone broth once I have the carcass and bones of 2 chickens. I’m so glad it could help you! Can’t wait for you to try it! That’s great, thanks! I wish I was better at carving a whole cooked chicken :) getting better though! Thank you so much! You’ll get better with practice. You can do it! You must give it a try! Thanks for sharing encouragement with me!